You know Christmas is here when: it takes you an hour to drive somewhere that normally takes 15 minutes; you can’t find a parking place at the mall; and people who are normally congenial snap at you. 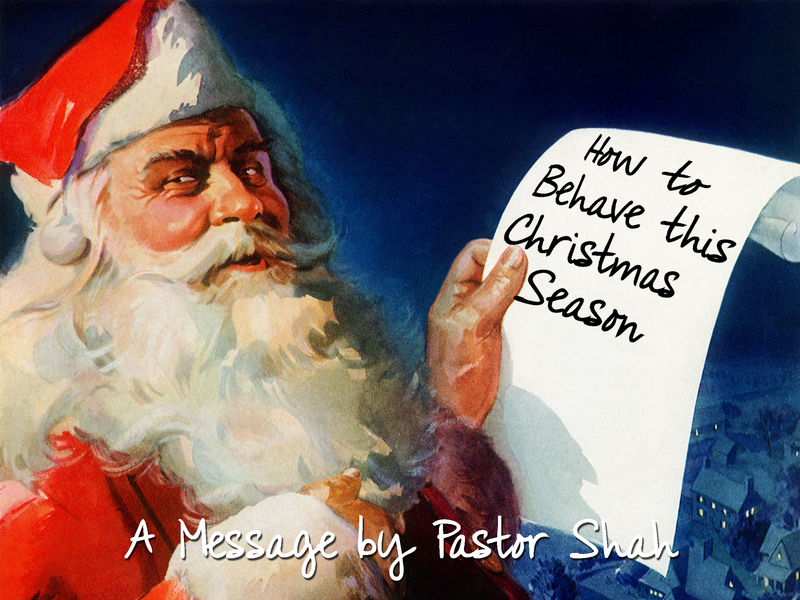 This series is to help us have the right attitude, not just during the Christmas season but also in every season of life. We try to pass the blame on this, that, and the other. The real problem in America is that most Christians have become anemic, lifeless, and weak. What is needed is the spirit of a Daniel, Esther, Nehemiah, Paul, Aquila, and Priscilla, men and women on fire for God. This morning if the spiritual temperature of our nation troubles you, stop looking to Washington or Hollywood and start looking in the mirror. Are you ablaze for God? I. BE ON FIRE FOR GOD. Christianity in America is suffering because we have lost the zeal, the fire, the passion, the urgency, the energy, the boldness, and the forthrightness that moved the world for God in previous generations. Anytime you say that, immediately we think of someone who is pushy and obnoxious, trying to cram the gospel down our throat. No one wants that. That does more harm than good for the kingdom of God. People run when they see you coming. What we are talking about is “being in a spirit of revival.” It’s not that we have the gospel but the gospel has us. We are driven by our convictions regarding the lostness of every human being, the eternal judgment that is waiting in the end, the salvation through Jesus Christ being the only hope for them. The church is not a cruise liner. It is a rescue ship. For e.g. Many years ago, when I first began in the ministry, I actually prayed to God for convictions. I had seen too many pastors and church people having a good time on a cruise liner while all around them there were people drowning in the water. It didn’t happen overnight but little by little God began to remove the complacency of my heart and replace it with His convictions. Guess who was instrumental in this? The Holy Spirit. Listen to the next phrase – fervent in spirit, Again a better translation would be “boiling by the Spirit.” In other words, Ask the Holy Spirit to set you on fire. Our zeal for the gospel is not some self-induced passion but the Holy Spirit Himself sets us on fire. What you and I try to light ourselves on fire we fizzle out but when the Holy Spirit lights us up we begin to burn with an incredible unquenchable zeal. Any heart that is willing can have the Holy Spirit. He will empower whoever will honor Him. Application: Many of us are on fire by the wrong spirit. The purpose of the Holy Spirit is never to glorify Himself or you. His purpose is to glorify Jesus. Jesus Himself said in John 16:13-14 13 However, when He, the Spirit of truth, has come, He will guide you into all truth; for He will not speak on His own authority, but whatever He hears He will speak; and He will tell you things to come. 14 He will glorify Me, for He will take of what is Mine and declare it to you. Now we begin to walk, talk, think, and behave as Jesus. Now when we meet people, they see Jesus in us. There is no place for sin and self. Application: Are you on fire for God? Are you filled with the Holy Spirit? Are you living every moment to magnify Jesus Christ? What is HOPE? There are 2 ways people use the word hope: One, I sure hope it works out. Meaning = I don’t think it will get better; Second, Hope is on its way. Meaning = Don’t give up. There is help coming. It is the expectation of something better to come. How are we to face tribulation? Be patient. It is not some passive putting up with things but actively standing and enduring. Application: Are you rejoicing in hope? Are you patient in the midst of trouble? Most of us busy ourselves in worry, in doubt, and in complaining. Our prayer is our communication with the home base. Stop praying and one by one like dominoes it will all crash. First to go is patience in trouble, next to go is joy, because there is no hope. Then, you are no longer following Jesus, no longer filled with the Spirit, and now you are simply existing with passion and zeal. In other words, your spiritual life, for practical purposes is dead. You can put up the tree, hang the wreaths, buy the gifts, sing Christmas carols but it doesn’t do anything for you or anybody else. Application: Did this message describe you? Are you ablaze for God? Or, are you burned out for God?